Depending on the school of practice of the Author or the Qigong Master, different concentration points and descriptions of the lower Dantian can be found. Roughly, it can be stated that the lower Dantian is situated in the lower abdomen. The description of the exact position may vary, but mostly it is considered to be three fingers width below and two finger widths behind the navel. Certain acupoints may give an idea about the exact position. Important points are Guanyuan (Ren Mai 4, Origin Pass), the door of the Yuan Qi and Mingmen (Du Mai 4, Life Gate), the door of vitality. In some cases, Shenque (Ren Mai 8, Spirit Gate) or Qihai (Ren Mai 6, Sea of Qi) are used instead of Guanyuan. All these points of the stomach area activate the Qi and support an upright posture of the body. Personally, I prefer Guanyuan as concentration point, because using it the inner alchemy – the strengthening of the essence of the kidneys – is accentuated most clearly. Guanyuan is the point of crossing of the three Yin-meridians of liver, kidney and spleen. It has a toning influence on the original Qi (Yuan-Qi) and soothes the mind. The middle Dantian is situated at the level of the heart. It influences the emotional health. 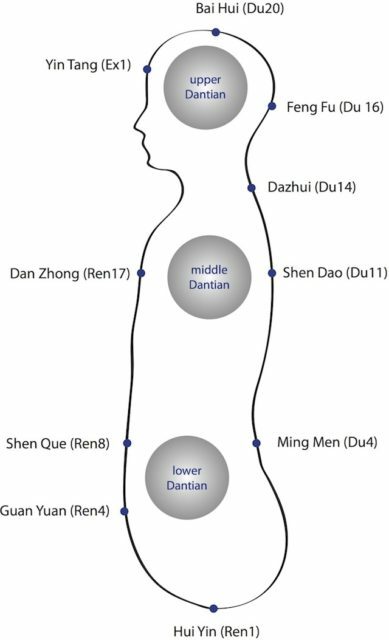 The acupoint Dan Zhong, the chest centre (Ren Mai 17) regulates and supports the Qi. It sinks down reverse lung and stomach Qi and it supports the female breast. Another relevant characteristic however is its role as mu-point (alarm point) of the Pericardium, and therefore also for emotional imbalances. 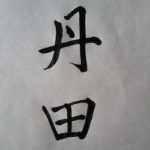 It is also the Upper Sea of Qi: from here, the Qi is dispersed throughout the whole body. The upper Dantian is situated inside the head, behind a point between the eyebrows (Yin Tang, Hall of Seal). It is connected to the mental abilities. Another important acupoint, which influences the upper Dantian is Bai hui (Hundred Convergences, Du Mai 20), the meeting point of all Yang-energies. This point stimulates and lifts the Qi and clears the consciousness.